Facebook advertisers using the social platform’s API and Power Editor tool have had access to their Custom Audiences ad targeting tool for a short time. But, many advertisers have yet to get access to the targeting tool until now. Starting yesterday, Facebook will has begun rolling out the ad targeting tool to a limited number of US advertisers, with a global roll-out beginning next week. Amy Gesenhues says all advertisers around the world can expect to see the feature by late November. This is especially of interest to small businesses who will be able to use their own customers lists to directly reach out to people on Facebook. You will also be able to use MailChimp lists with Custom Audiences for the first time. 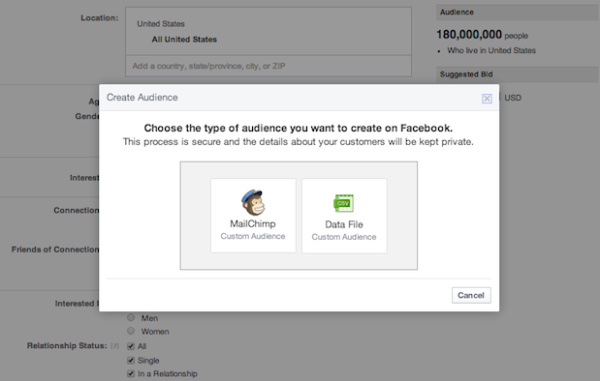 Facebook already claims thousands of advertisers are using Custom Audiences, but this will open the door for countless other advertisers to access the feature via Facebook’s ad interface. You will even be able to access the feature from Facebook’s mobile app, assuming you have already uploaded your contacts. SEO Basics: What's the Difference Between On-Page and Off-Page SEO?